First created in 1919 by Marcel Tolkowsky, brilliant round cut diamonds have traditionally been the most popular diamond shape. Tolkowsky used advanced mathematical concepts to craft and cut a shape that would maximize the diamond’s brilliance and sparkle. Thanks to his hard work, this shape is coveted by women around the world. The round cut boasts 58 facets yet still maintains a large percentage of the stone’s original weight. Because of its symmetrical shape, it captures light beautifully, putting the stone’s natural fire, brilliance, and sparkle on display. Cutting a round diamond by hand is not easy—especially if the diamond is smaller in size. 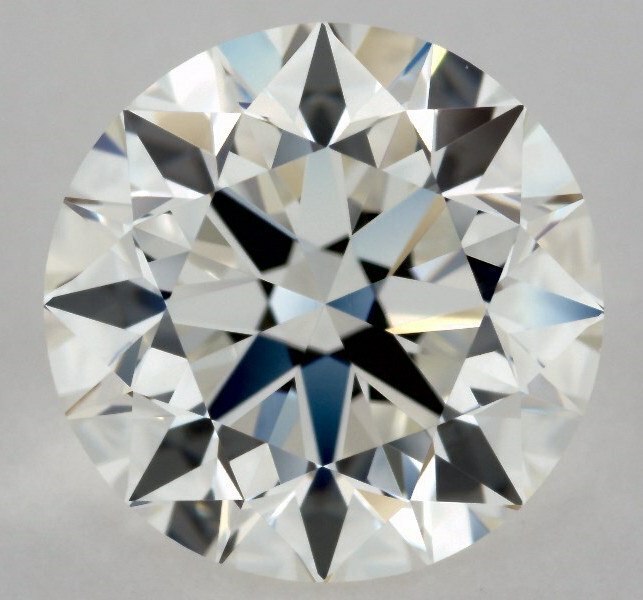 Fortunately, modern cutting techniques allow jewelers to ensure that even smaller round brilliant diamonds offer excellent light dispersion, maximizing the stone’s brightness and beauty. 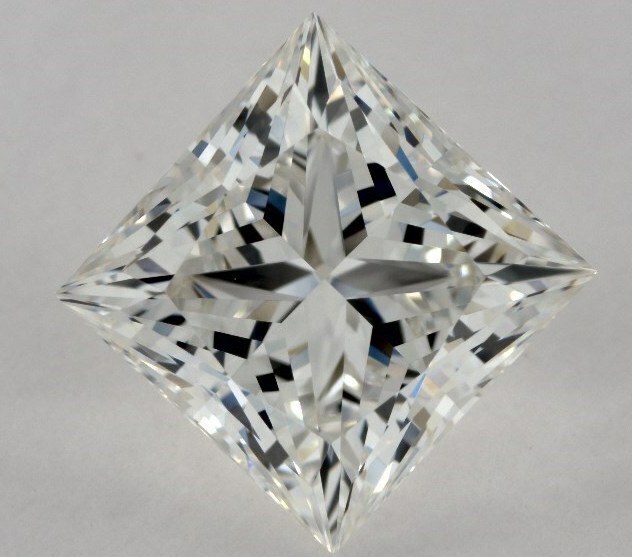 The princess cut diamond, on the other hand, was not created until 1961. Arpad Nagy, a diamond cutter living in London, created what he initially called the profile cut. However, the name did not stick, and the shape eventually became referred to as the princess cut. Princess cut diamonds are uniquely shaped and have a great deal of sparkle. A princess cut diamond is typically cut into a square shape, although they can have a slightly rectangular outline. These diamonds have 58 facets that are similar in position to those found in round cut diamonds. Which is More Affordable: Princess Cut or Round Cut Diamonds? There are many factors that could affect the price of a diamond. But in general, carat for carat, you are likely to find that square princess diamonds are more affordable than round brilliant diamonds. They typically have a lower price-per-carat than their round cut counterparts. Why? Diamond cutters typically use around 80% of the rough diamond when they create a princess cut diamond, which means only about 20% of the rough diamond will go to waste. However, diamond cutters lose much more of the rough diamond when they create round cut diamonds. When assessing princess cut vs. round cut diamonds, it should be noted that the creation of a round cut diamond wastes more of the original diamond than the creation of any other cut. If you want to find the most affordable princess cut diamond, look for one with a slightly rectangular shape. Diamond cutters lose more of the rough diamond when they create square-shaped princess cuts, so these diamonds are more expensive than rectangular princess cuts. Nothing sparkles and shines quite like a round cut diamond. Round cuts tend to handle light better, resulting in greater sparkle. They also tend to have fewer flaws and more clarity, which adds to their sparkling brilliance. If you want a diamond with a blindingly bright sparkle, the round cut is the right choice for you. If your heart is set on a princess cut diamond, make sure you choose the one with the most sparkle. Princess cut diamonds can come with either a brilliant or radiant cut. Opting for a brilliant cut will ensure that the stone’s sparkle is maximized and is most comparable to the brilliance found in a round cut diamond. Before buying a diamond, make sure you check its clarity grade. Each diamond is given a clarity grade based on the number of imperfections found internally and externally on the stone. Some diamonds hide imperfections better than others. Minor flaws are easily hidden or camouflaged in round cut diamonds because of the multi-faceted cut and brilliant sparkle. This means you can save money by choosing a round cut diamond with a slightly lower clarity grade since the imperfections will not be visible. Princess cut diamonds tend to have more flaws and imperfections than round cut diamonds. However, it’s common for these imperfections and flaws to be located in the four corners of the diamond. A prong setting will cover imperfections located in the corners, making the diamond appear flawless. Color is another important factor to consider when shopping for a diamond. Ideally, a diamond should be colorless. But, since colorless diamonds are expensive, many people must choose a diamond with slightly lower grades on the color scale. Round cut diamonds reflect more light than any other shape, which allows them to hide hints of color. Therefore, it’s perfectly fine to choose a round cut diamond with a lower color grade in order to stay within your budget. Princess cut diamonds, however, show more color than round cut diamonds. Be mindful when shopping for a princess cut diamond to ensure you do not choose one with too much color. You don’t have to choose a colorless princess cut diamond, but don’t go as low on the color scale as you would with a round cut diamond. Which Shape Fits Your Lifestyle? It’s important to choose a diamond that will work well with your lifestyle, which is why you should consider how princess cut and round cut diamonds will affect your day-to-day routine. For example, consider the fact that princess cut diamonds have four corners that can easily snag on your clothing or hair. This can be frustrating if it happens repeatedly, especially since it can lead to chipping over time. The best way to avoid this problem is to protect the four corners of a princess cut diamond with a four-prong setting to prevent snags. Another solution is to choose a round cut diamond, which has smooth edges that will not snag on your clothing or hair. If you work with your hands a lot or live an active lifestyle, this is an important factor to consider when selecting the right shape for you. Round cut diamonds are extremely versatile. They are often worn as a solitaire, in a two or three stone ring, or paired with other bands. 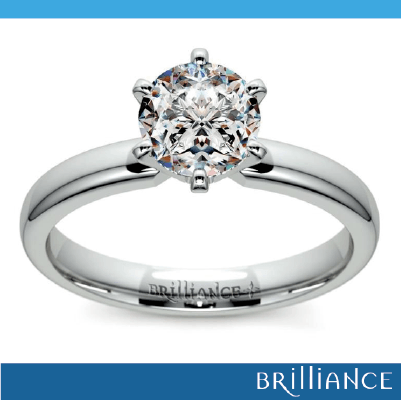 Because this shape is so popular, it’s not hard to find a wide variety of settings that feature round cut diamonds. If you can’t find the perfect setting, you can also choose a loose round cut diamond and make your dreams come true by designing a custom setting. 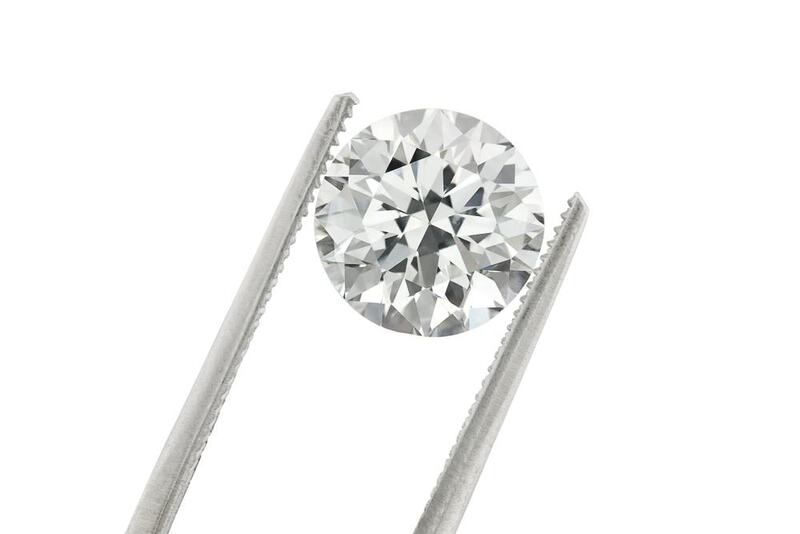 Round cut diamonds are typically found in four or six prong settings. But, if the round cut diamond is large, it’s best to secure it with six prongs instead of taking your chances with four. Princess cut stones are generally considered more contemporary than the traditional round cut diamond. They are usually placed in four prong setting, with one prong securing each of the diamond’s four corners. Princess cut stones also work well in stylish channel settings where the stones are secured between vertical metal walls, creating a channel or corridor around them. They pair beautifully with floral filigree settings, the cushion princess setting, or the princess diamond wrap. All of these are more modern designs that complement the unique look of the princess cut diamond. Princess cut diamonds and round cut diamonds work well with a variety of settings, so look at as many styles as you can while making your decision. Every stone has something special to offer. 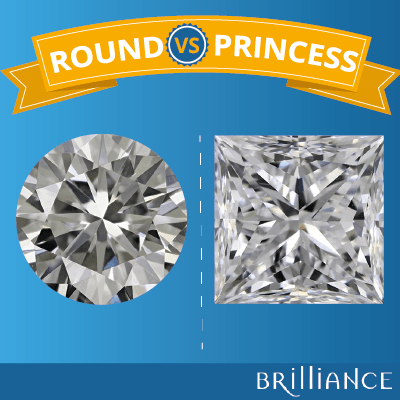 Which is Better: Princess Cut or Round Cut Diamonds? Now that you know the pros and cons of each shape, it’s time to determine which one is better. The round cut diamond has been a favorite for almost a century, while the square princess cut offers an edgier, more modern look. 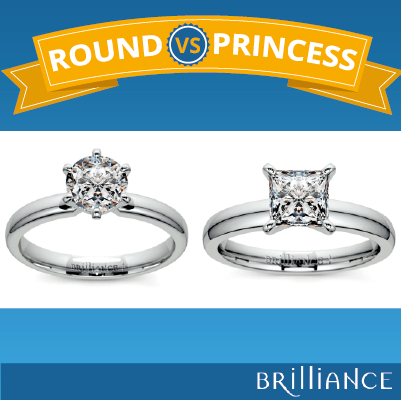 Both shapes are beautiful, so how do you choose between a round cut diamond ring and a princess cut diamond ring? 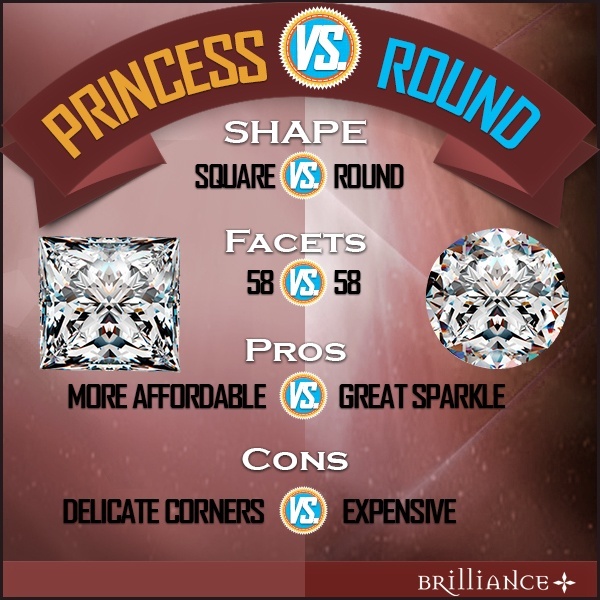 As it turns out, both princess cut diamonds and round diamonds offer unique advantages. Round cuts tend to have greater brilliance, whereas princess cuts may be better for your budget. Either way, jewelry experts agree that when comparing a princess cut diamond to a round cut diamond, it is a good idea to make no sacrifices in cut quality. If you have to make a compromise in order to satisfy your budget, you’ll find that it is normally better to do so in terms of color or clarity. A poorly cut diamond looks less beautiful, even if it is a larger one. It’s very important to consider factors such as cost, brilliance, and durability when choosing the right diamond cut. But, personal taste should play a big role as you evaluate different factors about princess cut or round cut diamond shapes. Each type of diamond looks different when placed in particular settings. For example, a princess cut diamond looks particularly beautiful in a three stone arrangement, while a brilliant round diamond can perform spectacularly in a halo arrangement. Think about what you prefer before deciding which diamond shape is best for you. Another personal factor to consider when shopping for a diamond engagement ring is the size and shape of the bride’s hand. Someone with a small dainty hand may prefer a smaller, more traditional setting, while a bride with larger hands may look best in a more contemporary setting with a larger stone. Brides should take time to look at several different options, try them on, and select the setting that looks best on their hand. Remember, there’s no right or wrong answer when it comes to selecting the right diamond shape. It’s all about what you love! Taking all aspects into consideration, the bride should choose the diamond cut and setting that she prefers and looks and feels the best on her hand. After all, a diamond is forever. By following these steps, you can ensure not only that you are making a wise financial investment, but also that the bride will have an engagement ring she absolutely loves.